YEEZYs could be described as both the best and worst thing to happen to sneaker culture. 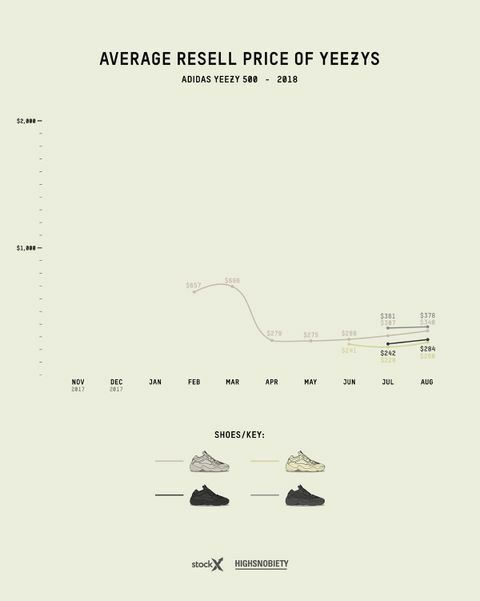 For many, YEEZYs were a gateway drug to the wider world of sneakers, but they are extremely polarizing. 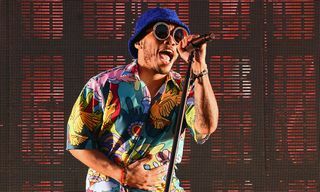 With their historically high resell prices, they have become a line in the sand between those who see them as the ultimate status symbols and those who have come to disdain the effect of Kanye West’s kicks on the market. In 2015, the YEEZY Boost 750 kicked things off between Kanye West and adidas. 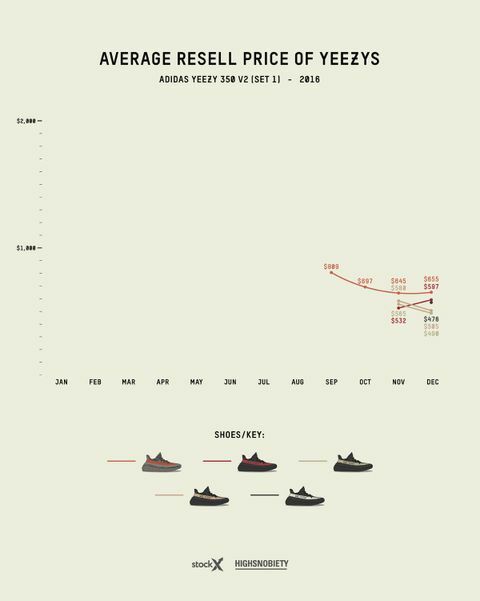 For the first few years, adidas Originals YEEZYs attracted extremely high resell prices. 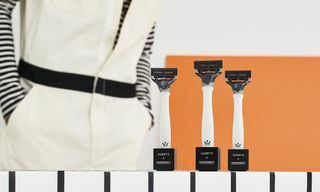 But recently, larger production runs and restocks have made models more accessible. In 2015, West told the world, “Eventually, everybody who wants to get YEEZYs will get YEEZYs,” and with the restock of the “Cream White” YEEZY Boost 350 V2 in 2018, he met this promise, with resell prices ticking down as more pairs hit shelves. 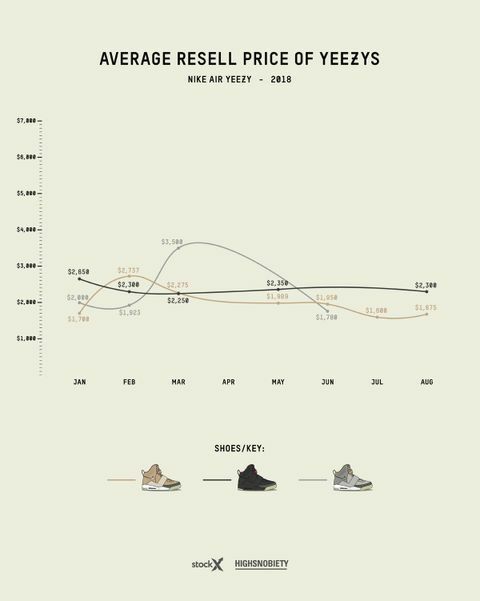 We’ve gone all the way back to West’s first sneaker collaboration with Nike, 2009’s Air Yeezy, fast-forwarding as far as August 2018 to track the prices of the rapper’s kicks on the resale market over the last three years. 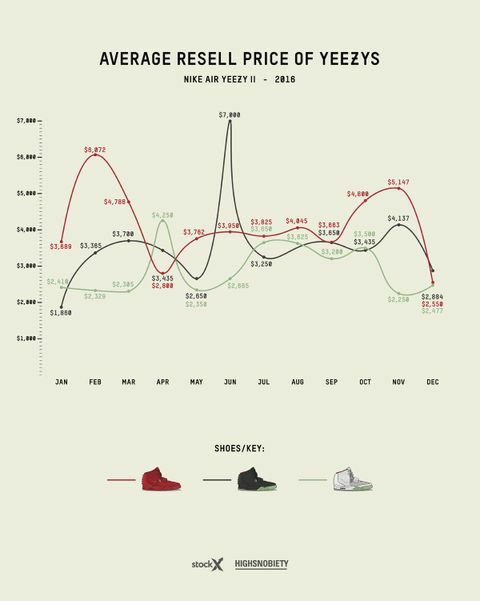 Check out the results below by scrolling through the galleries of graphs for each year, with data courtesy of our friends at StockX, illustrations by Dan Freebairn, and additional reporting by Fabian Gorsler. 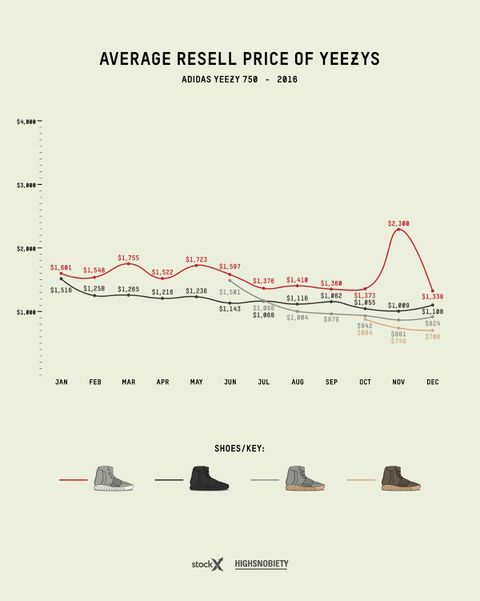 Editor’s Note: The data collected by StockX for Highsnobiety does not include adidas and Kanye West’s Powerphase series, cleated silhouettes such as the 350 and 750, or seasonal YEEZY boots such as the 950 or Desert Boot. Kanye West’s now-defunct Nike Air Yeezy line has always been synonymous with insane aftermarket rates. 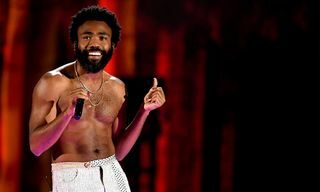 That includes colorways that actually got a release, although the big money was always in non-released sample colorways, which have historically sold for tens of thousands of dollars. 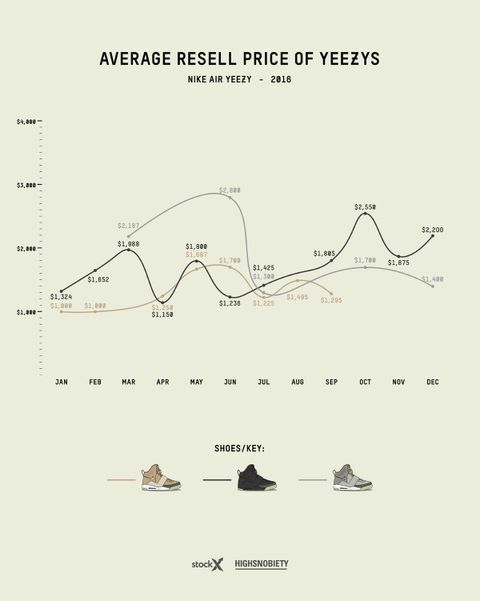 The first Nike Air Yeezy came out in “Zen Grey” on April 4, 2009, but StockX’s data set only starts in 2016, with resale prices in flux over the course of that year. Seven years after release, the 2016 numbers point to a seller’s market despite fluctuations, with every model going for an average of at least $1,000, four times the retail price, and that floor rising to $1,500 in 2017 and $1,600 in 2018. 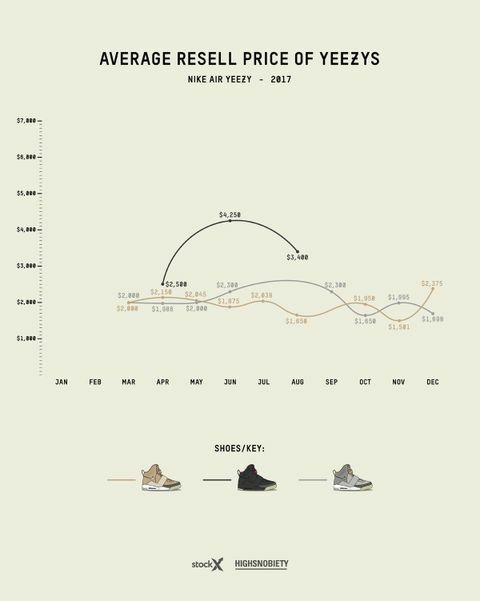 All of those floor prices are for the “Net” colorway, but the highest average price was $4,250 for the “Blink” colorway in June 2017, a model that was selling for $1,150 in April 2016. 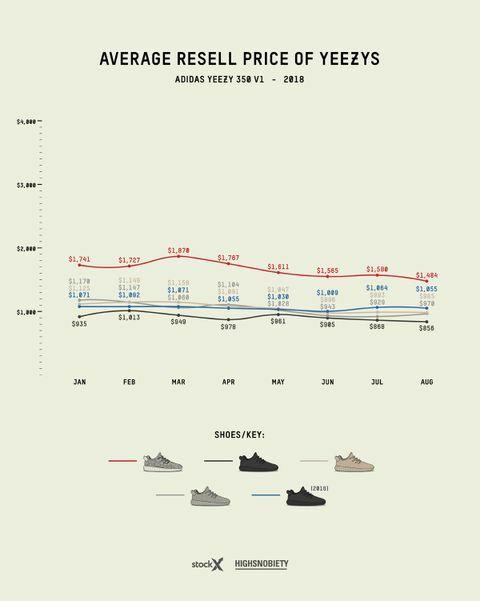 By the end of summer 2018, resell prices for all three colorways had largely flattened out and even tapered off compared with peaks in 2017 and early 2018, but the higher base price shows the effect of a dwindling supply nearly a decade after launch. 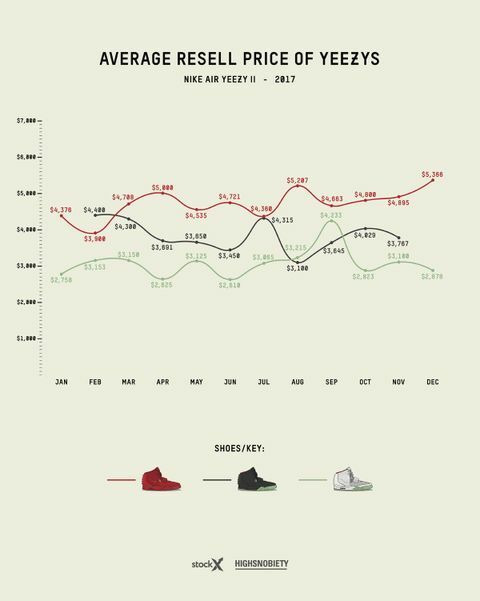 As you can see, the average resell price of the Nike Air Yeezy 2 pinged all over the place in 2016. The “Solar Red” colorway started below $2,000, spiked to $7,000 in June, and was going for $2,884 by the end of the year. Likewise, the most iconic Air Yeezy 2, the “Red October,” bounced within a range of $2,550 and just over $6,000 in 2016 before staying within the boundaries of $3,900 and just under $6,200 over the next two years. 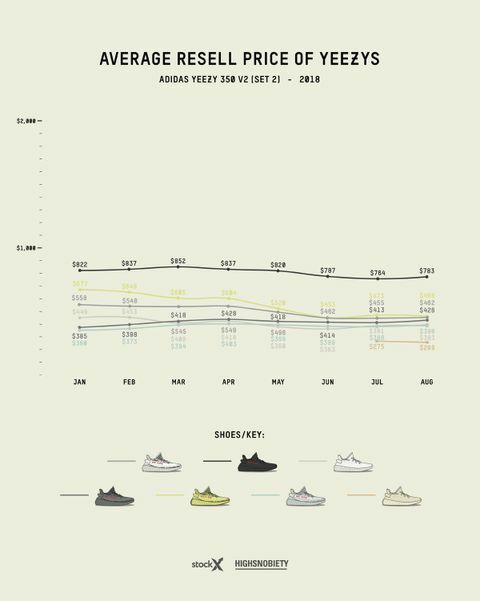 Prices for all three colorways stabilized more with every year, but like with the first Air Yeezy, we see a trend of the floor prices of each model going up with every year. The first thing to notice about the resell prices of West’s adidas YEEZYs compared with his Nikes is that the prices are more stable and not nearly as high even when they do peak. The latter can possibly be put down to the relative scarcity of a shoe released in 2009/2012 and resold in 2016-2018 versus one released in 2015. Not that the debut adidas YEEZY Boost 750 didn’t spike in price. 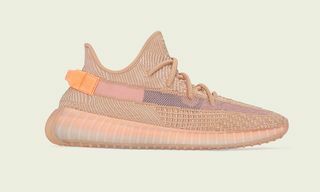 The OG colorway, released in February 2015, hit peaks of $2,300 in November 2016 and $2,860 in April 2017, making it the priciest adidas YEEZY to have resold on StockX. 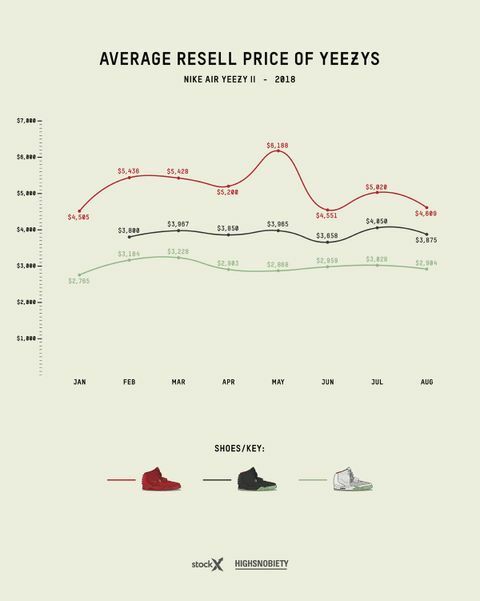 That said, unlike the Nike Air Yeezys, the average resell price of each YEEZY Boost 750 colorway — OG, “Triple Black,” “Glow in the Dark,” and “Chocolate” — trended downwards over the course of 2018. Like the 750 before it, the most valuable YEEZY Boost 350 is the original colorway. The “Turtle Dove” YEEZY Boost 350, released in June 2015, started 2016 reselling for an average price of $1,484, maintaining similar prices throughout the year before jumping to $2,055 in January 2017. Prices around $2,000 were the norm until July 2017, after which they started to descend, settling back on $1,484 in August 2018. The restocked “Pirate Black” colorway landed in February 2016 and from the get-go resold for more than the OG, making it a slight anomaly. The only major difference on the restocked version was additional collar padding. All five OG Boost 350 colorways resold for higher prices at the start of 2017 than at the start of 2016, making them a decent investment if you had a pair in early 2016. But by the start of 2018, all five models had dipped from their 2017 highs. By mid-2017, each model was reselling for more than $1,000, but by August 2018, only the “Turtle Dove” and “Pirate Black” restock were. 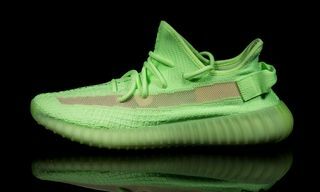 The X factor here could be the release of the YEEZY Boost 350 V2, which hit the market in late 2016, with various colorways following throughout 2017 and 2018. 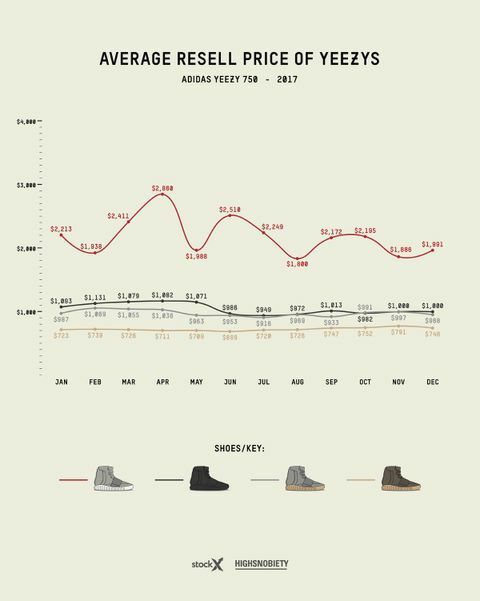 YEEZYs in general became more widely available as 2018 wore on, which might have had an effect on even these earlier, more collectible models. 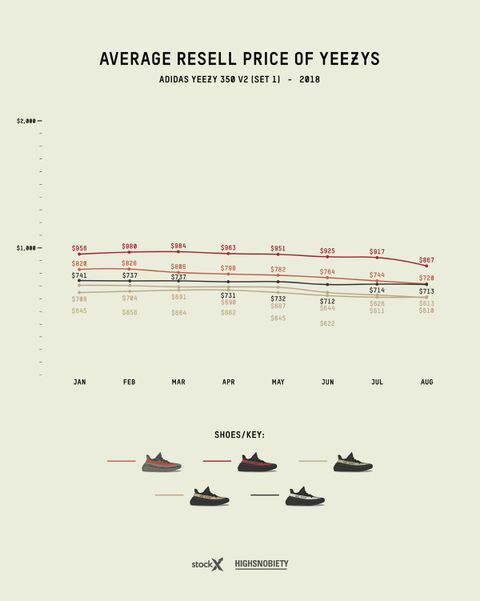 From the release of the very first YEEZY Boost 350 V2, the “Beluga,” aftermarket prices were lower than those of the silhouette’s predecessor. The “Beluga” Boost 350 V2 initially commanded just over $800 after release in September 2016, before dipping instantly. 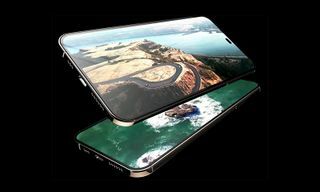 The releases that followed in November and December — “Green,” “Copper,” “Red,” and “Core White” — all debuted with even lower aftermarket prices, between $476 and $580. 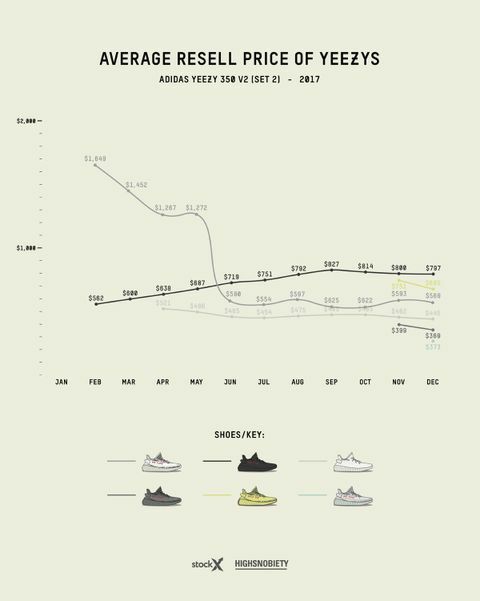 After 2016, the data for the YEEZY Boost 350 V2 is split into two groups: set one, featuring colorways released in 2016; and set two, featuring colorways from 2017 onwards. 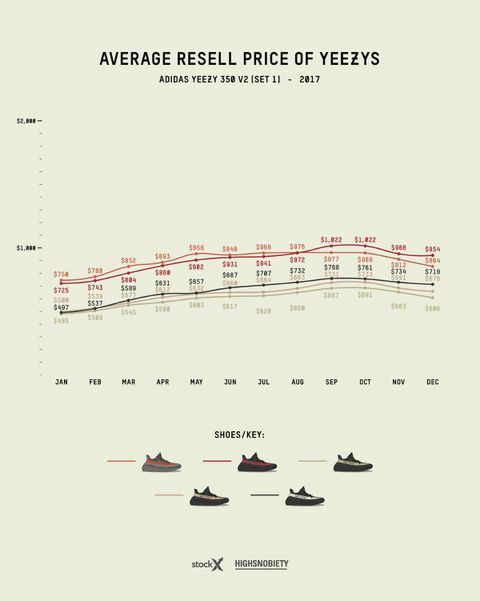 The 2016 V2s all rose steadily in value throughout 2017 until fall, with the “Red” colorway hitting the highest price ($1,022) of all the 2016 models in September and October. 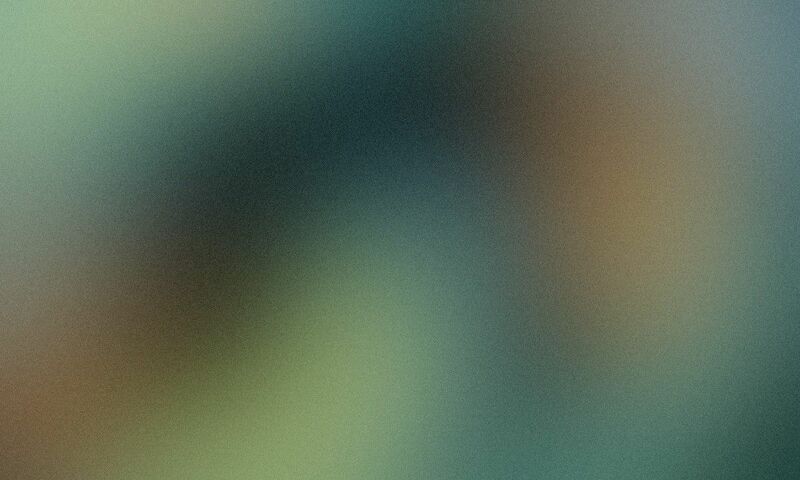 One of the newer pairs, however, was much more volatile. Released in February 2017, the “Zebra” Boost 350 V2 had maybe the most dramatic trajectory of all YEEZYs to hit the market, reselling for an average $1,649 on release before falling to under $600 after four months. 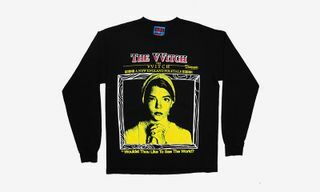 Restocks were the killer here. The first, in June 2017, sliced the “Zebra” 350 V2’s resale value in half between May and June. The other 2017 releases remained relatively constant, with only the “Black Red” colorway gaining significant value, starting at $562 in February and peaking at $827 in September. No YEEZY Boost 350 V2 other than the “Red” and “Zebra” colorways broke the $1,000 average resell barrier. 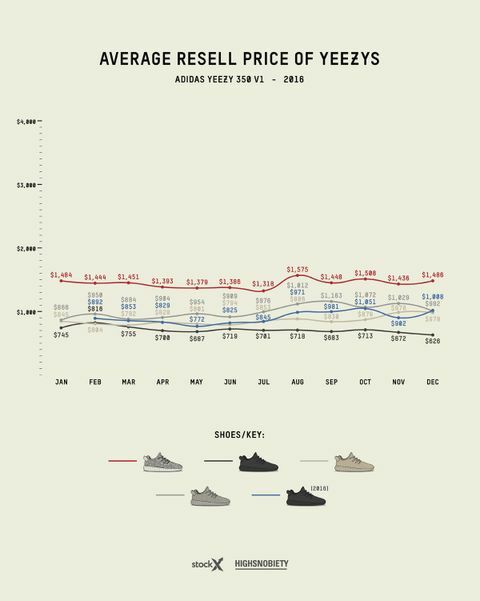 All YEEZY Boost 350 V2s continued the trend of falling YEEZY resale values in 2018, with every model reselling for less in August 2018 than it did in January 2018. 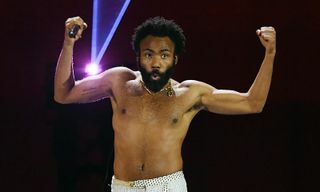 There were, however, no major dips. The 2016 models in set one were consistently valued within a range of just over $600 and just under $1,000, while the 2017 models sat within a range of $360 and $852. The “Red” and “Black Red” colorways remained the most valuable in each batch, the inflated value of the “Zebra” now a thing of the past. 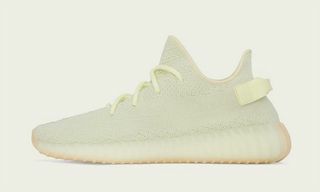 The “Butter” colorway, released at the end of June 2018, debuted on the aftermarket at $275, not much above retail — the effect of greater production runs in action. 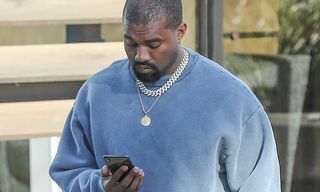 There are no confirmed production figures from adidas, only leaks and rumors, but it seemed from this point onward everybody who wanted to get YEEZYs was getting YEEZYs. 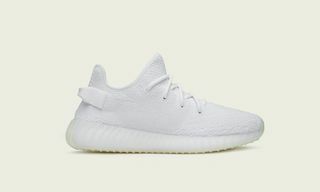 The “Cream White”/”Triple White” colorway was restocked in September 2018, after our data ends, becoming the most widely available YEEZY to date, according to adidas and Kanye West. The shoe didn’t sell out at retail, with a knock-on effect on resale prices. adidas went on to pull the remaining unsold stock from the brand’s webstore. 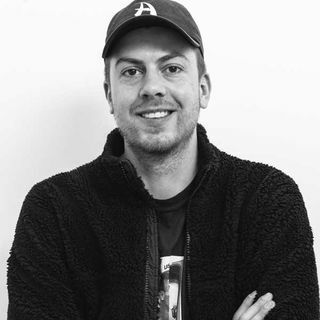 Editor’s Note: The above data for the YEEZY Boost 350 V2 “Zebra” was gathered prior to the latest restock of the silhouette on November 9, 2018. 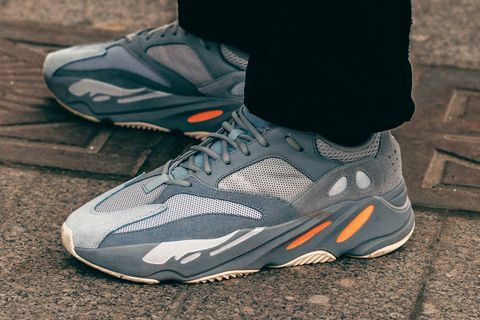 The second most expensive YEEZY sneaker to date had a relatively limited initial release, with the OG “Wave Runner”/”Multi” colorway’s resale value rising from $670 in November 2017 to $844 in February 2018 before a YEEZY SUPPLY restock in March sent its value plummeting to under $500. Prices recovered to a little over $500, but a second restock in September 2018 (not detailed here) saw prices dip to below $400 before settling between $400 and $500 this year. Editor’s Note: The data for the YEEZY Boost 700 in the graph above was gathered prior to the second restock of the “Wave Runner”/”Multi” colorway on September 15, 2018. 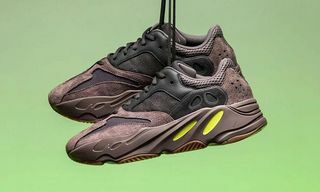 It also doesn’t factor in other colorways of the V1 Boost 700 that have since been released, the “Mauve,” “Salt,” and “Inertia.” We also don’t have data for the YEEZY Boost 700 V2 (“Static” and “Geode”). 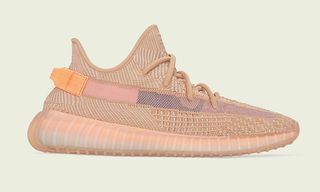 Arriving in February 2018 in a “Blush” colorway and at the time referred to as the “Desert Rat,” the YEEZY 500 started out on the aftermarket at nearly $700 before dropping to under $300 in April. From that moment on, Kanye West’s only non-Boost adidas sneaker has never been a big hitter on the resale market. The friends-and-family “Shadow Black” colorway has been the best performer. 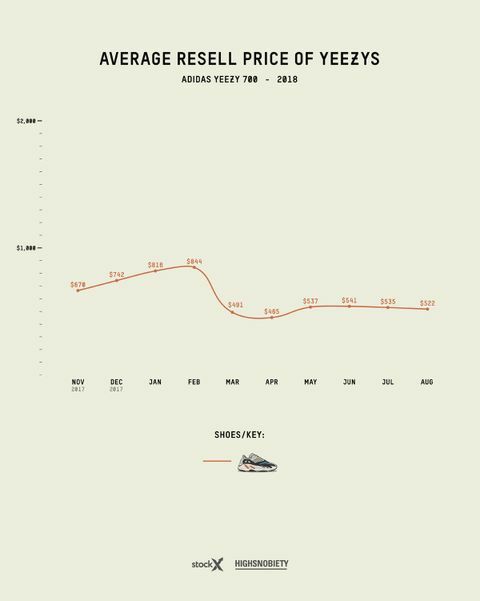 The shoe was given out in July and was selling for an average price of over $350 as far as the data takes us. The shoe’s average value on StockX has been around $450 since the end of 2018, but it’s still a bit of a steal compared with other friends-and-family releases elsewhere.